After busy for about two weeks, I have almost done all the CNY cookies, still have two more cookies to go which I have to use up the leftover egg whites. Beside almond flakes crisp, another cookies is ice cream cookies(meringue cookies) which most of the small girls love it. 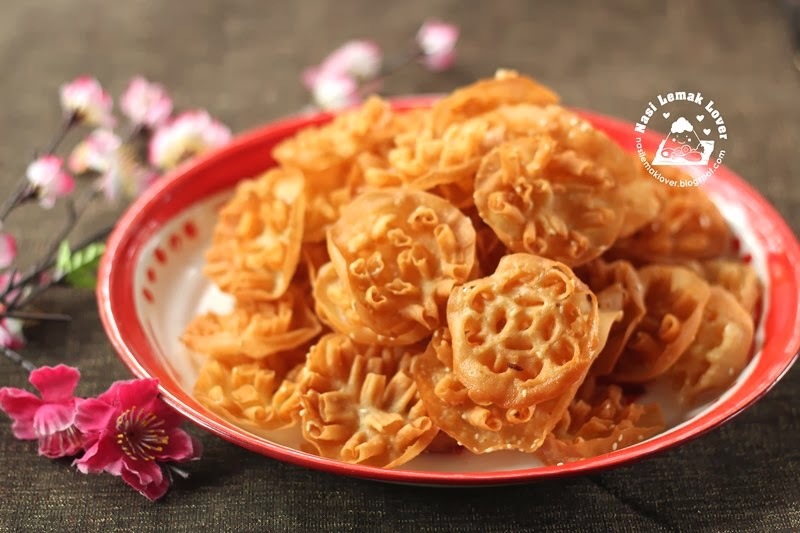 By popular demand, I have made 8 red canisters of pineapple tarts, this time I made into nastar shape which is easy and quick to handle, but I also try out a new shape- Golden Ingot which look golden and prosperous! 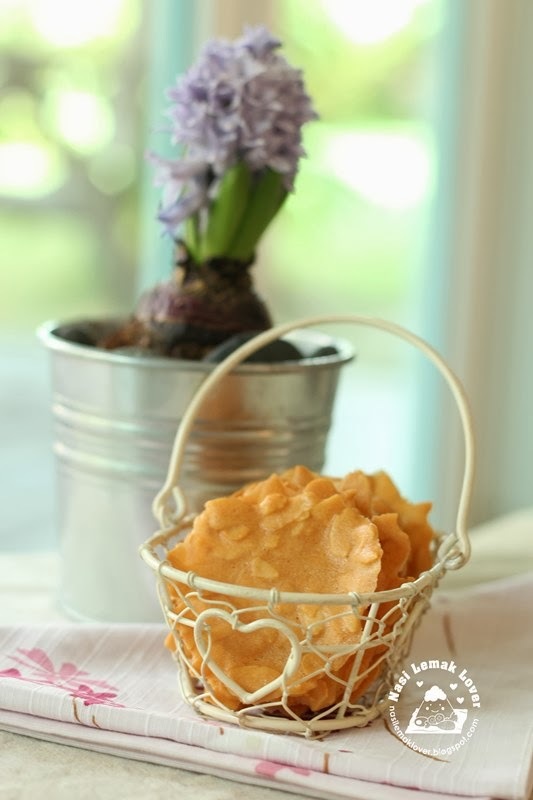 Last year I tasted my sister-in-law's honeycomb cookies and I was impressed with her cookies that tasted so crunchy and light. I made my first honeycomb cookies last year, even it was crunchy but towards hard but not light. 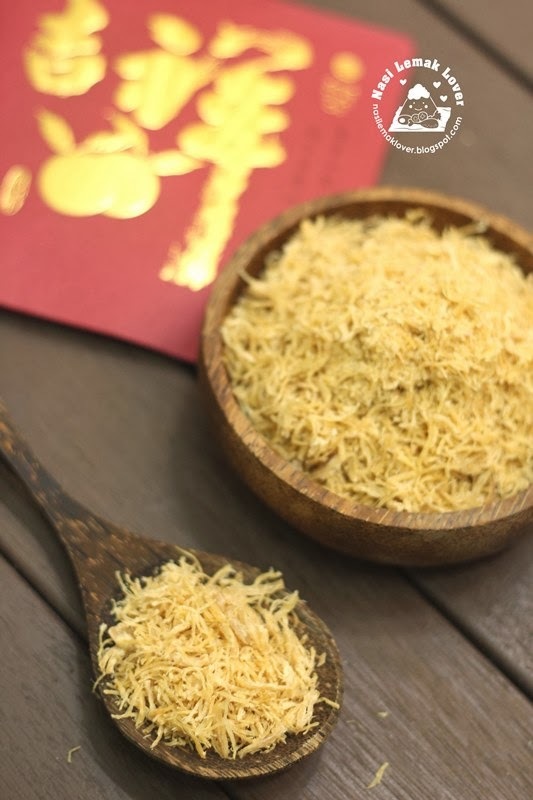 The other day when I chatting with my SIL about CNY cookies, I told her to make this easy Almond Flakes Crisp which is crunchy and additive. When she asked for a recipe, and I realized that I have few years did not make this cookie. Since I have some almond flakes left after I made the crispy almond butter cookies ( I have to sort out good shape of almond flakes for this cookies, so left those not even shape) and some leftover egg white, so I purposely made some and refresh my mind on how to handle this almond flakes crisp. 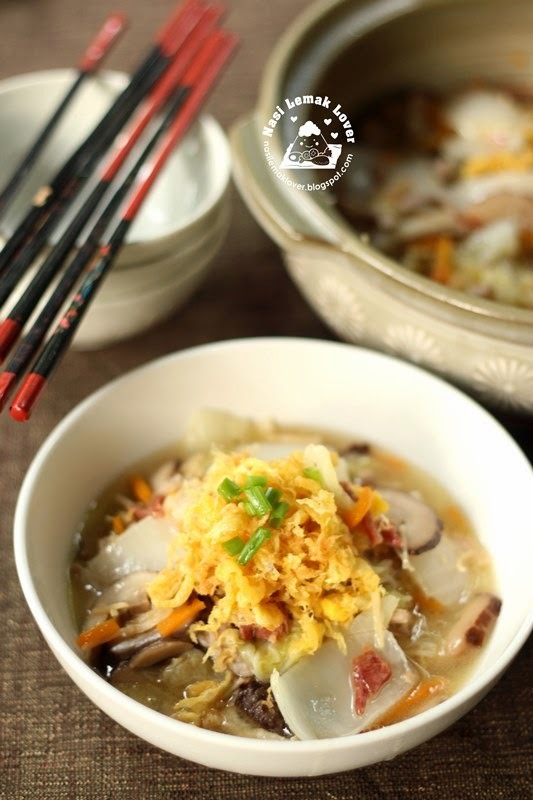 The braised Napa cabbage is a popular and common dish in Taiwan, they called it as 滷白菜. The other day I saw this dish in a Taiwan cook show (by Taiwan's celebrity chef 阿基師), and I know this dish must be good, because use Napa cabbage to braise it, sure taste very refreshing sweet. 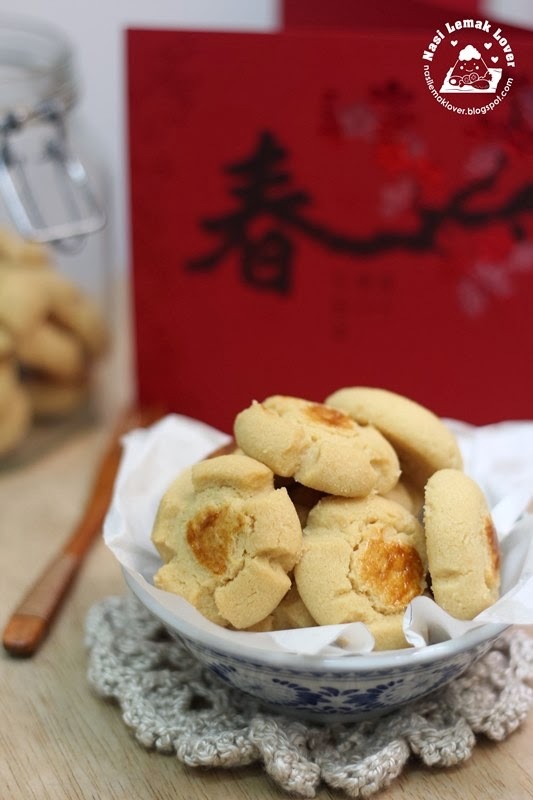 This is a new cookie recipe that i just tried out and I feel it is suitable for this coming CNY. When i saw this recipe in a cookbook, the special name and beautiful and unique crack effect were attracted me..It is a popular cookies at Nancy, France. Accordingly to here, The macaron de Nancy was first created at the Monastery Les Dames du Saint-Sacrement in Nancy, a Benedictine order founded by Catherine de Vaudément, Abbess de Remiremont and daughter of Charles III, Duke de Lorraine. Charles III could not eat meat, but loved sweets and chocolate. Nuns cooking in the monastery are believed to have created this simple wafer which became known as the macaron de Nancy. The other day, I saw a method of making meat floss published in a newspaper. Since the steps sound simple, so I also quickly try it out.. 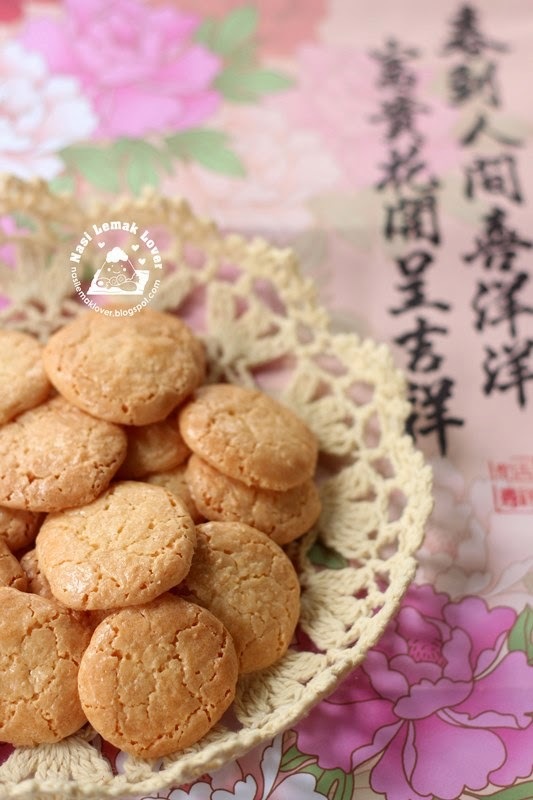 When I saw Lite Home Bake mentioned about the traditional Hup Tou Sou cookies (Hup Tou=walnut) some actually has no walnut, remind me of the Hup Tou Sou cookies made by Reese. I tasted her Hup Tou Sou cookies when I went to her house for a bloggers gathering few years back. I was surprised to learn from her that the usual Hup Tou Sou cookies that we bought at the pasar malam (night market) has no walnut (Hup Tou) actually. Maybe some of them contain walnut, but I am sure that those i tasted before has no walnut added as the taste was exactly like that one I tasted at her house. 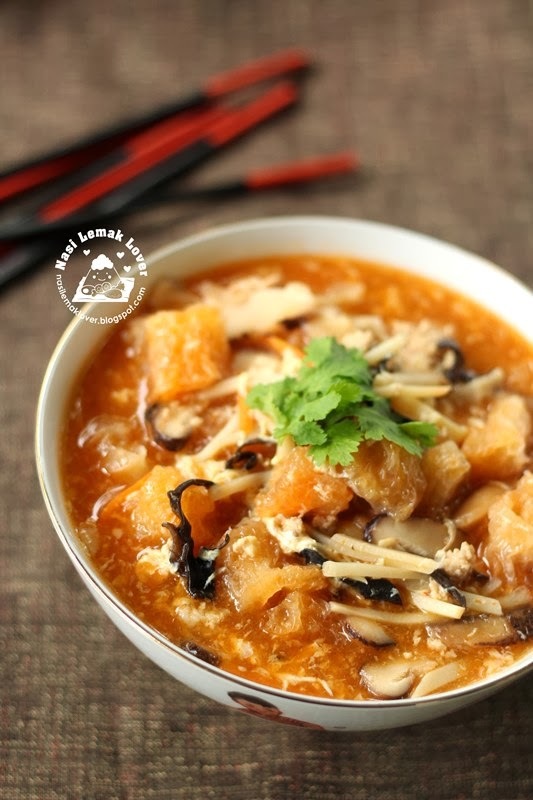 After I deep fry the fish maw, then I used it to cook this spicy and sour fish maw soup, love this version too ! very appetizing indeed.. Fish Maw 花膠/鱼鳔 is commonly used in Chinese cooking especially served during Chinese New Year as Chinese people consider fish maw to be a luxury item. It is an excellent source of collagen. 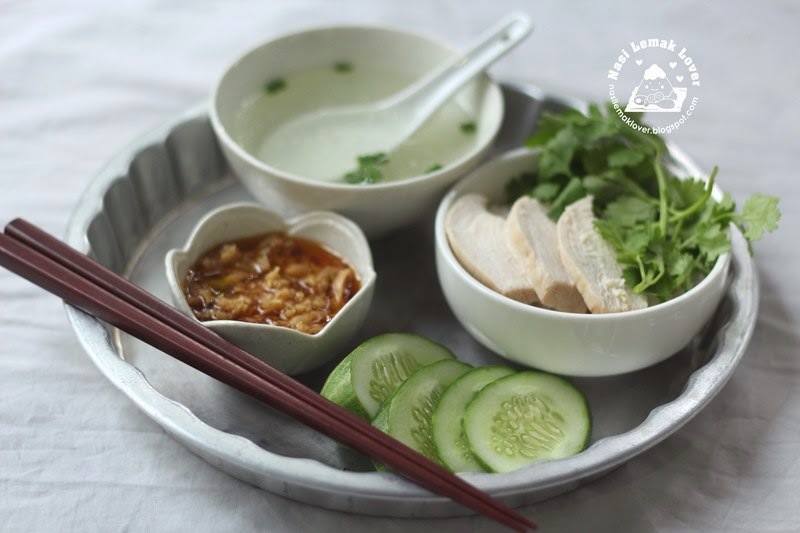 Fish maw itself has no taste, it takes on the flavour of the surrounding ingredients. 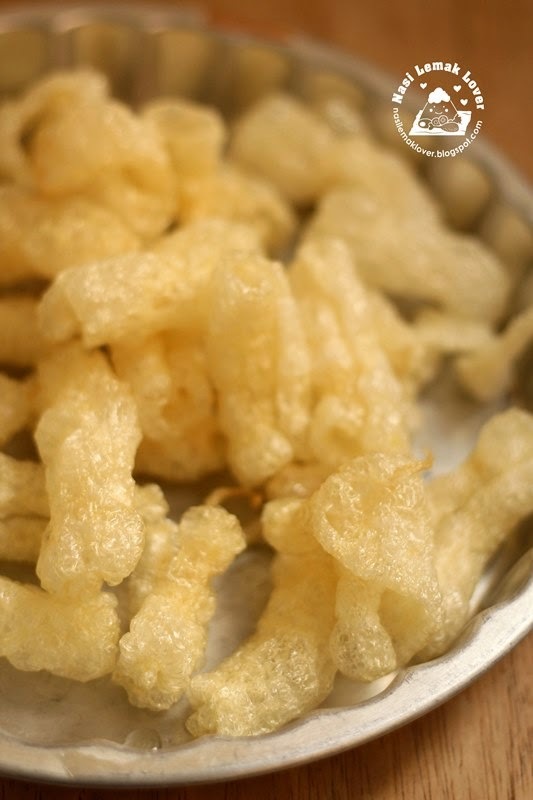 You can find ready to use fish maw which already deep fried at the market, but my mother like to purchase the dried fish maw from the fisherman and deep fry by herself ( so we know it is clean and safe) . So I try to learn from her and share it here. Nowadays I prefer to cook less oily Thai style chicken rice (only use chicken breast) than the usual Chinese Hainanese chicken rice but we still go to our favourite Hainanese chicken rice stall quite often. I had cooked this Thai style chicken rice earlier, but this time I adapted a new dipping sauce from a new cookbook that I bought during a book sale few months ago And this new dipping sauce was equally good if compare to the earlier recipe. 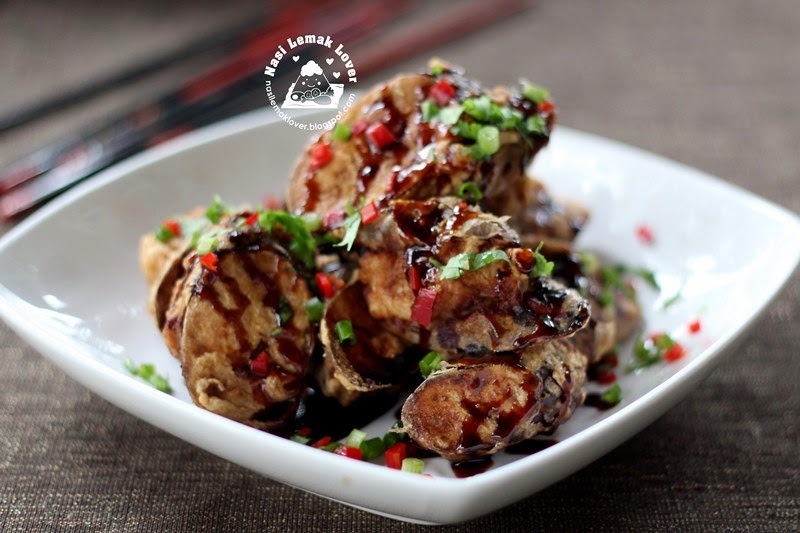 I saw a crispy fried eggplant photo shared by Nami Just One Cookbook in her Instagram, she had this dish in a Chinese restaurant. I know it must be very delicious, as I always prefer eggplant to be deep fried. So I created this recipe and it was well received by my family, even my kids not fancy with eggplant, also gave thumbs up. 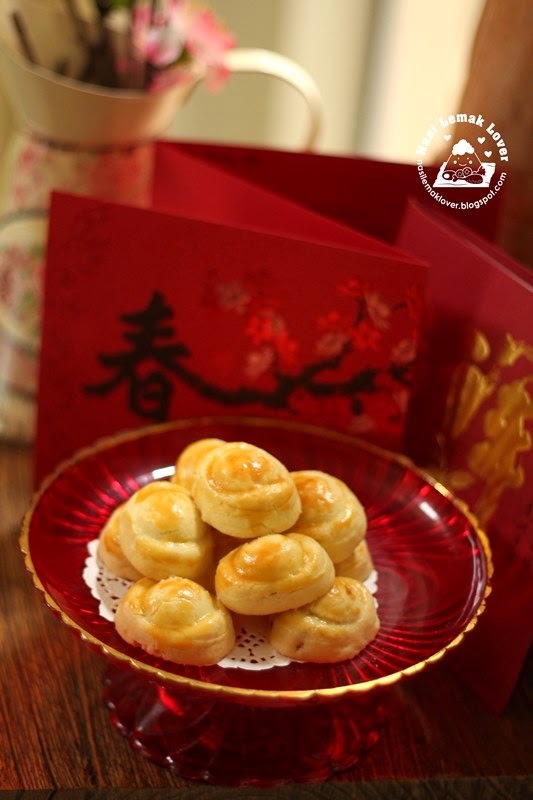 After Christmas and New Year, Chinese family is also getting start to preparing some cookies for the coming Chinese New Year celebration. 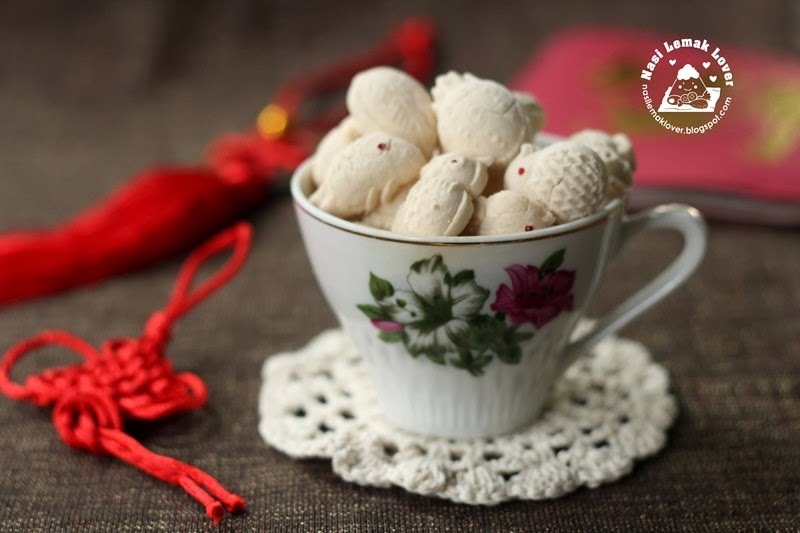 If you would like to try out some new recipes, you may check out my earlier Chinese Delights 2013 event round up posts here or you may refer to the top page at my blog header. 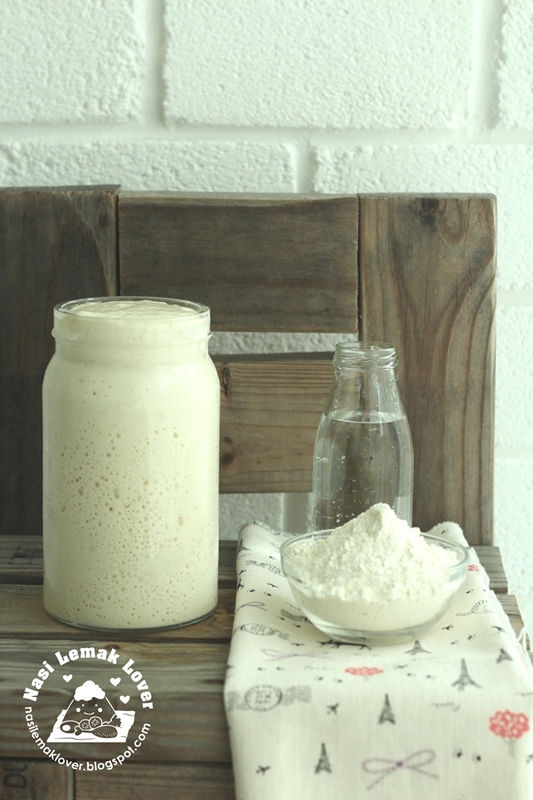 There are many good recipes shared by many bloggers, check it out! 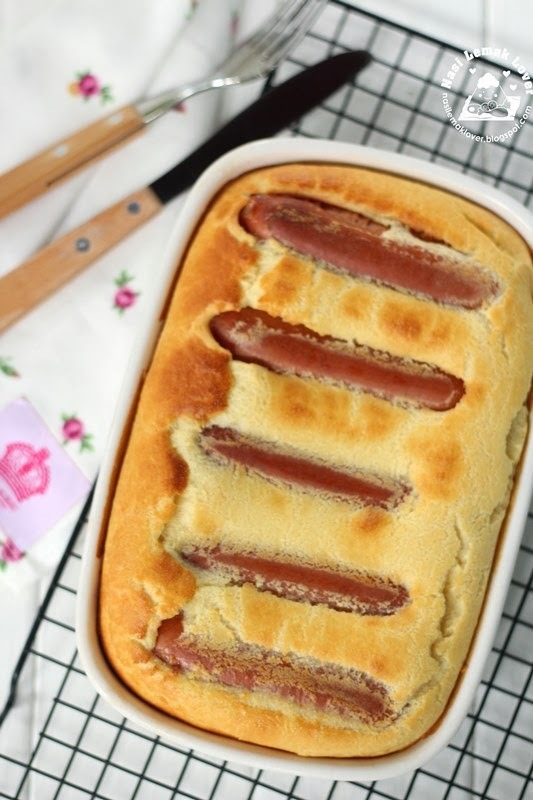 I made this Toad in the hole during Christmas time, even though we didn't celebrate Christmas, but I still prefer to make some Western foods during this time. Toad in the hole is a traditional English dish comprising sausages in Yorkshire pudding .The origin of the name "Toad-in-the-Hole" is often disputed. Many suggestions are that the dish's resemblance to a toad sticking its head out of a hole provides the dish with its somewhat unusual name.